I mentioned a few weeks back that I was hoping to return from our trip to Dallas on Memorial Day weekend with a new piece of furniture. As you may have guessed from my lack of posting on said piece of furniture, the deal didn't go down. While doing my usual browsing on Craigslist, I came upon a beautiful leather ottoman that I thought would be perfect as our new coffee table. You all know I've been searching and analyzing over finding a new coffee table for some time now. Well when I saw this one, I thought I had found my answer! And with a price tag of just $100 (the cheapest I'd found prior was $300), it was a gift from above! 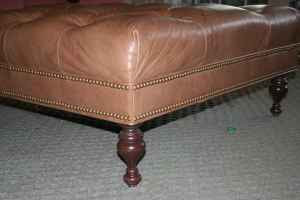 I thought the color and nailhead trim were just what the coffee table doctor ordered. Unfortunately, the deals you can find on Craigslist are often counteracted by the difficulty of communicating with the seller. The problem in this case was the seller's slow response to all of my inquiries. He said I would be able to come view it while we were in town that weekend, but then never got back to me on what day or where. 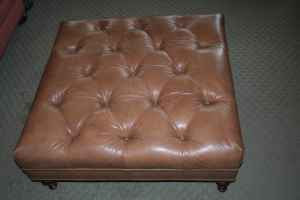 Before I knew it, the weekend was gone and my dreams of the ottoman were too. I assumed the seller must have sold it to someone else and thus didn't respond back to me, but it sat on Craigslist for at least another week before the listing was gone. Oh well. I guess it wasn't meant to be, and the search continues! And I have to say, this velvet one is pretty amazing too.